Ladeau Manufacturing specializes in fabricating aerospace hinges, an established niche product of our company for more than 70 years! Aerospace hinges are high precision and possess a very high strength-to-weight ratio. We manufacture each one to absolute and exacting standards. Many of our clients are aerospace professionals or distributors in this technical field. They come with thorough quality clauses and challenging demands. Additionally, our Mil-Spec hinges and pins, such as MS20257, MS20001, and MS20253 , become destined for aerospace endeavors. The term “aerospace hinge” is an umbrella term for hinges specifically designed for aerospace applications, both commercial and military. 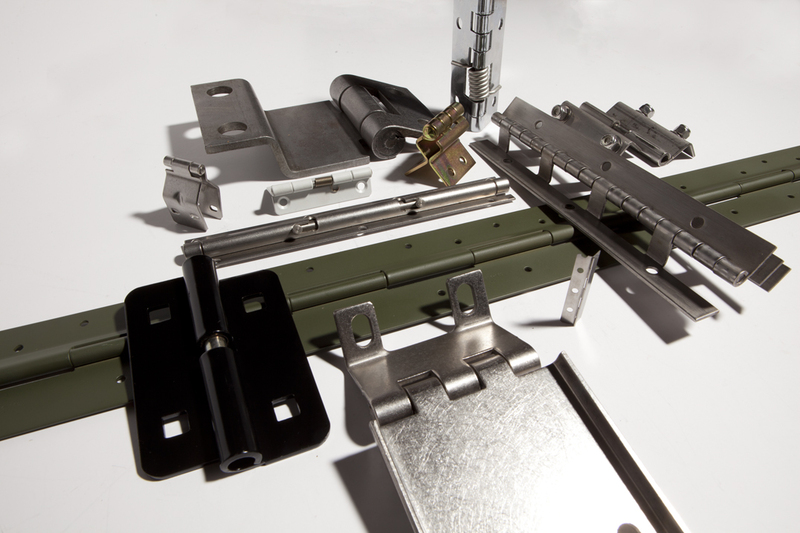 Since a broad array of aeronautical applications are involved, a myriad of hinge types are utilized for purposes that run the spectrum from critical to common functions. Large commercial airliners, business jets, helicopters, fighter jets, military transport, drones, space exploration craft and satellites all rely on the unmatched strength and dependability that aerospace hinges are recognized for. Aerospace hinges are installed on doors of cargo, passenger and galley aircraft in addition to landing-gear doors. On some aircraft, the plug door (which seals itself via the pressure difference on its two sides) will partially open inward; and thanks to the complex hinge design, it can be tilted to fit through the fuselage opening. Aerospace hinges are embedded within a vast array of aircraft components including, not only the doors, but wings, empennage and many other exterior and interior applications. Elevators are flight-control surfaces located, typically, at the rear of aircraft. The elevators control the craft’s pitch and lift of the wing and are hinged to the tailplane or horizontal stabilizer. Pitch hinges are part of a helicopter’s rotor which allow the blades to twist about the axis, extending from blade root to blade tip. Teeter hinges permit one blade to rise upward while the other blade moves, downward. Aerospace hinges are used on satellites and other equipment headed into the outer reaches of space. The merciless environment of outer-space calls for customized hinges that can perform in extreme settings with zero gravity and temperature extremes. Miniature satellites, for example, are equipped with solar panels which depend on complex aerospace hinges. The panels are dependent on their hinges to move into exacting positions, when required. The hinges open and close the solar panels via computerized commands, and are designed to open at only specified angles, such as no more than 180 degrees. Customized spring hinges meet this need with ‘stop features’ built into the hinges’ knuckles. The solar panels play a critical role on satellite platforms by recharging internal batteries and ensuring mirrors and lenses for data-capture are operating as expected, in addition to deploying antennas for communication back to earth. Aerospace hinges get a lion’s share of the credit for making it all happen!